Most critics, whether they dislike the D-O-E water corridor for conservation, environmental, or other causes, complain about a lack of relevant data on detailed routing of the corridor. It is to be said that such records indeed exist, and they are available to everyone. The responsible authorities, namely the Ministry of Transport of Czech Republic, have seen to proper documentation of the route recorded on maps of the scale 1 : 10,000. Let us ignore objections like I-don’t know-what-the-canal-looks-like-and-where-its-route-leads-but-I-amagainst- it, and respond with Leonardo da Vinci’s quote: “He who thinks little, errs much.“ Let us assist those who truly seek to acquaint themselves with the current solution and its links to the environment. Let us help those who lack the precious time or patience to bite their way through piles of the official map documentation. A schematic route map of the water corridor D-O-E with stages and variants. It is quite understandable that the routing, as described further– although leaning on official sources – does not have to be final. The following preparation stages could bring detail specifications or even some bigger changes. It is quite natural with projects of such type. Some sections are proposed as alternatives and the final selection among them might call for further research and studies. We would like to take the liberty to point out some possible, or rather advantageous, alternatives even in cases when they have not been yet officially evaluated. Such critical approach is usually permitted. Direction of our pilgrimage along the D-O-E water corridor route shall follow the stream of anticipated progress of construction work. The site of the Morava influx into the Danube under the ruins of Devín. The water corridor D-O-E would branch-off here in case of the variant A or D.
We shall set off at the Danube, where the first stage is expected to start, and we should pay special attention to the individual regions. Incidentally, the region (and state) borders fall almost exactly in line with the stages. The choice of variants awaits at the very starting line. It has changed few times in the past, although never for technical reasons but rather for the political ones. Proposals drawn in connection with the Waterways Act (1901) presumed that the canal route would run to the west from the Morava all the way up to the Moravian border and on up to Otrokovice, i.e. through Cisleithania, carefully avoiding then the Hungarian territory. Practically it concerned a right-bank line Vienna–Angern–Hohenau–Lanžhot–Hodonín. After the breakup of Austrian–Hungarian monarchy in 1918, the line got cut by the Czechoslovak–Austrian state border, which the Czechoslovak authorities viewed as a serious handicap. Therefore, the project was corrected in order to keep the entire route on the territory of a newly established republic. The new left-bank line, defined by the locations of Devín–Jakubov–Kúty–Lanžhot– Hodonín, did not cross to the opposite bank until above the mouth of Dyje, where a canal bridge was proposed across the Morava at Lanžhot. A view of the branching-off place of the water corridor D-O-E at Lobau (var. B and C). At the front, the main bed of the Danube; behind, a recently established floodway; at the back, a cca 1 km long working section of the D-O-E canal (right) flowing into the port of Lobau (left). The other part of the canal (at the very back) was completely separated with a dyke. By the extinction of Czechoslovakia in 1939, the route moved to the right bank again to return back after the Czechoslovak state was re-established in 1945. Currently, after the Czechoslovak federation has been divided, the situation is quite similar to that of 1939.There is neither a chance of leading the route exclusively through one country, nor any pressing political reasons to favor one or the other bank line. For the first time, there is an opportunity to confine the decision strictly to technical, economic, and ecological reasons, while taking into account needs of all the three countries, i.e. the Czech Republic, Austria and Slovakia. As a basis of the respective international negotiations, a feasibility study of the first D-O-E water corridor stage was drawn in 2003, which registered three alternative solutions, marked as variants A, B and C. Additionally, on the demand of the Slovak Republic, the fourth variant D was included, which was to enable utilization of the renewable water energy of the Morava River in the relevant section. The solution covers the route up to Hodonín, where all the variants meet from both the layout and the altitude point of view at 163.2 ms ASL. Realization of the first stage between the Danube and the stage terminal port in the South Moravian Region is of cardinal importance for the Czech Republic, even though the actual route only touches the territory. It runs either through the neighbouring countries or in the frontier riverbed of the Morava from Kúty to Hodonín. Via the Danube artery, it will link the Czech Republic to the network of reliable European waterways. It should guarantee the future development of Czech water transport, if not its bare existence in future at all. The connection will allow export and import of goods within the southeast corridor along the Danube all the way to the Black Sea, as well as within the west one, along the Upper Danube, the Main – Danube waterway, and along the Rhine to the largest European seaports, including Rotterdam. Although there is an existing access to the Rhine area, it is only through the Elbe, which unreliability hardly meets the modern water transport standards. It is even safe to say, that the traditional Elbe connection to Hamburg could be in emergency economically substituted with the detour via the Danube, Rhine and the German canals. • In the area of Břeclav and Hodonín an important transport junction is coming to life, marking a contact point of three countries – the Czech and Slovak Republics and Austria. After the first stage of the Danube–Oder–Elbe water corridor is completed, the place will become a unique terminal of road, railway and water transport. • The same area represents a significant water management centre, which will fully develop other functions of the water corridor in terms of water balance and flood control. • The first stage of the D-O-E water corridor should guarantee a reliable link of CR to the network of modern European waterways, which need is ever more pressing. The South Moravian Region can be rightfully called a base of the Czech water transport development. • Tourist boats vessels and river cruisers will considerably contribute to attendance rate of the major regional sights, especially the Lednice-Valtice Cultural Landscape and the wine making areas. Landing stage for passenger boats on the Morava above a dam in Hodonín. The pool of the dam could be considered a working waterway of a very modest size, however, with no connection to a continuous system. The stage terminal in South Moravia could admit river-sea going vessels as well, thus enabling straight shipping form and to the ports on the Black and Mediterranean Seas, or even more to the east. The first stage will truly begin a new chapter of the water transport development in the Czech Republic. Hodonín pool on the Morava represents a practically ready-made section of the D-O-E water corridor from Hodonín to Rohatec. Why is one stage of the D-O-E water corridor not enough for the Czech Republic? • It is unreal to assume to expect the neighboring countries of Austria or Slovakia to offer their territory or financial contribution to realization of a waterway, which is a mere dead-end branch for South Moravia and not a complete transit connection. • The limited project of the first stage only would hardly acquire a large international interest and the related financial contribution. • The limit of one terminal port only means to degrade the majority of transport relations to fractional transport, which is less economical. The waterway must be connected to the main resources and destinations of the Czech territory. • If the realization is limited only to the first stage, the project will have to resign on most its extra-transport benefits in the fields of water management, flood control, conservation etc. The most prominent water management advantages do not concentrate along the state border but rather to the route of the following stages. Let us set off along the route of the following stage two then. It runs mostly through the territory of the Zlín Region, with a short section still in South Moravia and the north part reaching to the region of Olomouc. The title of the chapter does not exaggerate. Between the wars, the Morava River was subjected to a number of alternations, although they were not supposed to become a part of the D-O-E waterway, as they were motivated otherwise: flood control, irrigation, “small” navigation within Baťa Canal, waterpower utilization. Nevertheless, it appears that the contemporary concept can use entire stretches and a large number of their facilities. The pool of the Hodonín dam represents the first ready-made section, which can be included in the waterway practically without further adjustments. However, the water level heave of the Hodonín dam ends at Rohatec. The D-O-E water corridor will have to leave the river there and transfer to a right-bank lateral canal. Such routing has even other reasons: firstly, the Morava upstream from Rohatec has kept its natural character so far, practically untouched by human hand, with wonderful meanders and on-going dynamic riverbank processes. • Due to Baťa Canal as well as other water management facilities in the area, the region features almost ready-made sections of the D-O-E water corridor. It is only necessary to link them, so that they can be fully employed in all their functions, like effective flood control (especially endangered areas include Kroměříž, Otrokovice, Uherské Hradiště, Staré Město and Uherský Ostroh), considerable increase of attractiveness of industrial locations and search for new economic projects. In this respect, the D-O-E water corridor could become a spine of the whole region. 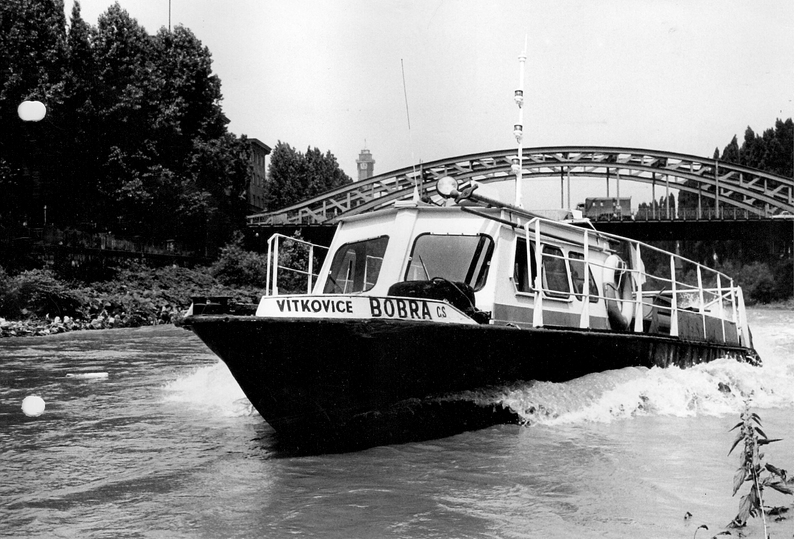 • Also further development of tourism, and pleasure boating especially, should account for another indispensable benefit of the D-O-E waterway, as it is to connect the currently isolated Baťa Canal with the continuous European network of waterways, thus including the area to all-European pleasure boat cruising tours. So-called collapsing banks are a spine of the PLA Strážnické Pomoraví. Any interference with the current character of the landscape – extremely rare in the country – would be an inexcusable mistake, which even an inexperienced and insensitive water corridor designer would hardly choose to commit. Secondly, the favourable morphology of the right bank terrain will allow construction of a higher lock at Rohatec, which 18-km pool will be suitable for navigation. The right-bank D-O-E water corridor first follows the railway quite closely and cuts through large sand quarries, and later enters the existing flood diversion canal of the Morava between Uherský Ostroh and Strážnice. It was built between the wars to protect the townships of Uherský Ostroh and Veselí nad Moravou, had nothing in common with the D-O-E waterway, although it now represents another of its almost ready stretches. Its turn into a waterway will require some changes, though: it will be partially widened and constantly filled with water – not only in flood periods. Its banks should be more naturally landscaped, with shallow lagoons on their sides. Namely, the unsatisfactory tree dressing of the banks in mostly neglected fruit tree alleys should be substituted with trees natural for riverbanks. The discharge capacity of the canal will increase considerably, which should further intensify the flood control of the above-mentioned cities. The canal route will turn back into a river one entering the pool of the existing dam in Nedakonice. The Nedakonice dam pool represents another ready-made stretch all the way up to Staré Město at Uherské Hradiště. The Nedakonice pool will call only for minor alignment improvements at Kostolany nad Moravou. A newly arisen island in the river should host artificial biotopes and the movable weir in Kunovský Les would be dismantled as the Nedakonice dam at full heave would make it redundant. The following section Staré Město–Spytihněv again runs in a right-bank lateral canal with one lock. It follows quite exactly the route of the present Baťa Canal. Transferring of part of high discharges to the D-O-E water corridor will reduce the flood danger in the area from Napajedla to Uherské Hradiště. A pool of the dam Spytihněv is lined with deadend branches and gravel pits. Add only buoys marking the channel and it will pass for an international waterway of Vb class on the D-O-E water corridor. Elevation of the Spytihněv pool is not to change as it guarantees sufficient navigation depths all the way to the following dam at Bělov. Thus, the Spytihněv dam is yet another basically ready section, which needs only slight alignment improvements at Napajedla and Otrokovice. The Bělov dam lock will enable reaching of the Bělov pool, which water level will have to elevate a little. The dam was adjusted to the future elevation already when under construction. Its initial section is satisfactory in terms of depth as well as the routing direction of the waterway. The only correction will be needed at Kvasice. The real problems await at the end of the elevated part in the area of Kroměříž. The official documents of regional planning registered a route preferring to detour via the left bank to a straight stroke through the town. The final routing will have to be optimized yet. Kroměříž – a bird’s eye view of “the Athens of Haná”. Behind the castle (front) there is the large Podzámecká Garden lined with the Morava River. The D-O-E water corridor routing solution required serious compromises here as not to affect the garden in any way. The route circles around the left-bank part of the town (behind). The waterway crossing through Kroměříž has two major problems. First of all, it does not allow routing with radii 800 – 1,000 ms. If the waterway was to avoid the valued Podzámecká Garden, the project had to settle for R = 600 ms only in two cases. Neither that treats the problem as the navigation channel in such bends would have to be widened to 40 + 28,3 = 68,3 ms, which cannot possibly fit the narrow space of Kroměříž. The option of the compromise, settling on the realistic width of 50 ms, would limit passing of convoys in both directions in the bends, i.e. declare them a navigation narrow. The necessary elevation of a road bridge in the town centre is not an easy task either. The solution may appear in a form of yet another compromise: a slight increase in the vertical alignment by 1–2 ms, so that the bridge offered enough clearance at average discharges, and a movable bridge construction (swing or lifting bridge) in the navigation opening. Such bridges are quite common e.g. in the Netherlands, Belgium, USA, Canada or France, distinctively contributing to the landscape coloring. Although a central Moravian citizen will hardly welcome the red light not only at crossroads or railway crossings but also at a movable bridge. Luckily, such situation would be extremely rare in case of the bridge in Kroměříž. Only at the higher discharges, when the water level should reach extremely high and an extremely large vessel should need to pass (a vessel carrying three tiers of containers, for instance). To let the D-O-E water corridor route detour Kroměříž treats both the problems at once, while it intensifies the town flood control. The deviation has been considered earlier already, but only for high water reasons, without any navigation use. However, this option is rather costly as it requires a new motorway bridge on D 1, which is currently being built, and elevation of its vertical alignment. The through-town alternative has no such problems as the motorway bridge over the Morava already meets the navigation needs. On the northwest fringe of Kroměříž , there is a high movable weir on the Morava. The waterway will reach the level of its pool via a lock built either near the dam or on the by-pass, to enter the last nearly ready-made stretch of the D-O-E water corridor in the area of the Morava River. The pool of the Kroměříž dam spans almost to Kojetín, where the route has to leave the Morava entirely and run in a left-bank lateral canal with a lock at Záříčí connected to the pool of the reconstructed dam Troubky on the Bečva. At floods, this section of the water corridor – already on the territory of the Olomouc region – will relieve both the Morava and Bečva rivers at their confluence and could become the first part of a flood control system protecting Přerov and its surroundings including Troubky, which was so heavily hit at the 1997 flood. Apart from that, it ought to provide an access to the port of Přerov as another stage terminal after the one in the Břeclav–Hodonín area. A turning place at a level crossing with the Bečva is the end-point of the second stage of the D-O-E water corridor. A detour to the port of Přerov near Henčlov branches there. The port is designed as a multimodal logistic centre with an industrial zone of its own, connected to a railway junction and a future motorway. Another extension can run through the Bečva riverbed up to the already existing plants of chemical and engineering industry in Přerov. Along with the port of Přerov the route of the second stage should feature berth on the right-bank canal in the area of Veselí nad Moravou–Uherský Ostroh na Moravě in Staré Město, in Otrokovice and in the section Kroměříž –Kojetín. The berth in Otrokovice should be larger both in size and in significance, as it will be connected with an extensive industrial zone. Finally, the navigation may lead through a short stretch of the Bečva adjusted for one-vessel traffic to reach the already existing chemical and machinery plants in Přerov. Industrial plants in the west suburbs of Přerov lie on both the Bečva riverbanks. Its riverbed could run a branch canal extension connected to the D-O-E water corridor. Coexistence of the waterways should have three forms. In the short stretch between Staré Město and Spytihněv Baťa Canal will be substituted by the right-bank canal; the whole fall will be passed in one lock of medium rise. It is likely that a special small lock for pleasure boating will have to be added. Both “small” and ”large” navigation would operate in the pools of the Spytihněv and Nedakonice dams, while the small lock in Nedakonice would be kept in order to allow transfer of pleasure boats to the parallel Baťa Canal from Nedakonice to Rohatec, where this canal comes to its end in about 1 km from the Hodonín pool on the Morava. If the canal was to be connected to the pool through the Radějovka River, and a necessary small-rise lock was built (Rohatec lock), the little parallel waterway would become a through route. Such arrangements would allow round pleasure boating trips through Moravské Slovácko along both the “small” and “major” waterways, which could considerably contribute to the tourist attractiveness of this part of Moravia. The territory of the Olomouc Region will bear the constituent part of the third stage of the D-O-E water corridor, including the exit branch to the Danube and Oder watershed. The nodal point from which in future waterways should run in three different directions – to the Danube, Oder and Elbe – has also been designed in this area. However, in relation to the D-O-E water corridor, the region is a kind of a crossroads even today – a crossroads of opinions, which are often not much obliging. Why is that so? The protest events, which largely are held in Olomouc, are perhaps fed with the distrustful atmosphere, which governs the Faculty of Science of Palacky University. The reserved attitude of economic circles of the region may originate in sceptical views of the prompt realization of the D-O-E water corridor. According to them, the gradual development of the project will reach the Central Moravian region only in a far future, i.e. too late to aid in dealing with the pressing regional problems like flood control. The denominator of the pessimism is similar to the other regions; in the region of Olomouc it is only more pronounced. One of the important factors is lack of information on the project routing, on impacts of its realization and its regional functions. • The completed third stage of the D-O-E water corridor on the Olomouc Region territory will bring to life one of the most important junctions of European waterways, which will connect three seas and could be righteously called the port in the heart of Europe. • The region will benefit from the water-management effects of the D-O-E water corridor, which will be most apparent in Haná, as well as from its flood control function; the proposed dry polders will bring a positive impact even to the regions of Zlín and South Moravia. Development of long-distance cruises will boost visitor rates of many sights on the route of the water corridor (Olomouc, Bouzov, Hranice, Teplice nad Bečvou etc.). Let us move on, then, and continue describing the D-O-E water corridor route from where we have left it in the previous chapter – on the Bečva river in Troubky. The canal only crosses the Bečva on the same level and does not lead through its riverbed, with an optional exception of the branch for the Přerov plants. Beyond the river, the route should underpass the main railway track and behind it – at Rokytnice – it should enter the first of the high lock series with saving basins heading for the actual fork of the Oder and Elbe branch. The length of the Rokytnice pool – from the next lock on the Oder branch to the next lock on the Elbe one – is exceptionally convenient due to the terrain circumstances of Haná – more than 50 kms. The pool can easily compare to the pools of North German or Dutch canals. Let us first follow the route to the Oder. The officially protected route should circle around Přerov and follow the northern side of the main railway track around Lipník all the way to Hranice. Then, close to the cement mill, it crosses to the southern side, where it cuts through the European watershed at the village of Kunčice with either a deep cut or a canal tunnel. A view from the point where the official solution, circling Hranice wide, crosses the watershed of the Danube and Oder towards the town. The Hranice cement mill is in the centre of the picture. The arrow marks the southern portal of a 1.3 km long canal tunnel. Such solution appears more suitable than a deep cut (the terrain of the watershed lies at 315 ms ASL). The solution will be decided according to ecological and economic aspects. The D-O-E water corridor then enters the river basin of the Luha, the Oder tributary. It follows its valley, still south from the railway tracks, all the way to Jeseník nad Odrou. The next section of the third stage, i.e. the descending part of the water corridor, is already on the Moravian Silesian territory, which is treated in the following chapter. It is worth noticing, that the route ascends from the long Haná pool, which altitude equals the Elbe altitude in the flatland below Hradec Králové, to the “rooftop of Europe” only through two high locks: in Buk near Prosenice and in Trnávka near Lipník nad Bečvou. It is now essential to emphasize the crucial importance of the lowest spot in the centre of Europe for the routing of the D-O-E water corridor. It is as valuable as the narrowest part of the American continent for the Panamanian economy. We are talking the Moravian Gate. There is hardly anything else of similar significance that the country has to offer to Europe. For the section Buk–Jeseník nad Odrou, there was an alternative solution considered. Although not a long time ago it was excluded from the official documents, the newest research has proved it much more convenient from both the economic and flood control point of view. The alternative route crosses the main track as well as the first class road 47 only at Prosenice, runs between the road and the Bečva (eventually, in a short stretch above the Osek dam, straight through the Bečva riverbed to Hranice). Above the dam in Hranice, it passes to the Hranice pool. Its construction was designed to allow slightly higher elevation depending on the need of the waterway. This pool takes the D-O-E water corridor route through the so-called Teplice narrow and runs on along the wide Bečva valley to the village of Hustopeče nad Bečvou, where it turns sharply to north and crosses the watershed between the villages of Poruba and Palačov. Both alternative routes join again at Jeseník nad Odrou. The alternative option has been investigated several times throughout the history. Last time it attracted engineers in 1960s, when a large reservoir on the Bečva at Teplice was being seriously considered and even prepared. At first sight, it was tempting to lead the navigation through the wide lake and save several kilometres of the artificial canal routing. Only at first sight, though, as merely the entrance to the dam reservoir would need to be fitted with an oversized lock of up to a 30-m fall, which due to the number of locked vessels would certainly become a capacity bottleneck. Next, it would be necessary to respect the actual purpose of the reservoir. It called for a significant water level fluctuation, which would influence even the length of the elevated water surface. Below the minimal reservoir water level, the through navigation channel would thus have to be deepened. The Teplice reservoir would thus represent more of an obstacle than a navigation advantage. Superficial knowledge of this episode provokes numerous misunderstandings; e.g. that for the D-O-E water corridor the dam is essential, if not as part of the route, then at least as a reservoir of water for the lock operations. It is yet another mistake, which certainly does not contribute to the fair evaluation of the project. It is not only that the dam lake at Teplice would be in a way; the contemporary concept of providing water for a waterway would make it absolutely redundant. Owing to the water management role of the D-O-E water corridor, the project of this dam, once considered an essential water-managing reservoir of the Morava river basin, could be definitely abandoned. The D-O-E water corridor could provide the Morava with more water and at lower cost that the Teplice dam. The enthusiasm of routing the waterway through the Teplice narrow and the reservoir of Teplice nad Bečvou has thus gradually disappeared. Other aversive aspects of the alternative route have only contributed to that. It is almost 7 kms longer that the currently official route, plus it requires three locks instead of only two: at Lipník nad Bečvou, at Černotín and at Poruba. In addition, the Teplice narrow does not allow the required radii of bends, therefore, similarly to Kroměříž, extremely small radii would have to be applied (650 or even 600 ms) as well as (perhaps even) some short sections of one-way traffic and regulated traffic of longer convoys. The final decision about the case should be very careful. The Bečva in a narrow near Lázně Teplice. The riverbed is wide enough to accommodate the D-O-E water corridor route, although with quite sharp bends in some places. If the large reservoir at Teplice is not an option any more, the dry polder of the area remains the more topical. The concerned cross-section allows retaining and transformation of flood waves, which threaten the whole Bečva basin, as much as the basin of the Morava below the Bečva mouth. The body of the waterway, led south from the main railway line from Černotín to Hustopeče, could optimally outline the polder and rid of the costly re-loadings of the line as well as the parallel road. The combination of a polder (e.g. of the volume of 50–100 mill. m3) and the D-O-E water corridor would be highly convenient rather than problematic, like in a case of a reservoir with a significantly higher water level. Moreover, a part of the flood discharges could be simply transferred from the Hranice pool to the waterway, which would lower flood threat in the section from Hranice all the way to Kroměříž. If you consider the 25 % lower costs of the alternative corridor routing and cutback on construction costs of the actual polder, this solution currently appears much more promising than the official routing, and thus should be documented as fast as possible, for the realization of the polder has grown rather urgent already. If realization of the dry polder is not carefully coordinated with the D-O-E water corridor, serious economic may occur. Therefore, with the respect to higher chances of the alternative solution the attached situation and longitudinal cross-section document it in detail, while the official route is treated only in general. Let us now return above the lock in Rokytnice and follow the route towards the Elbe. The D-O-E water corridor should head for Velký Týnec, circle Olomouc from the east and run through intensively farmed, practically forestless flatland around the villages of Štěpánov, Moravská Huzová and Pňovice towards Střelice, where the long Haná pool finally comes to the end. The first high lock with saving basins will have to be erected there to start the ascent to the Elbe watershed. Owing to the navigation linkage of the port of Olomouc in order to manage economically the overplus from excavations as well as for protection of the city against floods, the relatively easy section of the Elbe branch up to Pňovice should be considered an integral part of the third stage of the corridor realization. Above the lock of Střelice there are two alternative routing options. The first one – officially protected – heads for the town of Loštice, where it enters the Třebůvka River valley; the other one leads around Králová, through the saddle of Úsov to the wide valley of the Morava at Dubicko, crosses the river, and along the main line runs to Zábřeh na Moravě, where it enters the Moravská Sázava River valley. According to engineering of each solution, they could be nicknamed the lift and the lock alternatives, respectively. The officially protected lift alternative will have to cut through the PLA Litovelské Pomoraví and interfere with the Morava River in terms of a level crossing, which will call for a dam construction. Quite naturally it has stirred severe protests of conservationists. They argue eloquently that granting an exception from the law, which literally bans routing of navigation canals through protected areas, would be far from easy. Most probably, such statutory exception will not be needed, as nowadays the lock alternative appears much more convenient from both the technical and economic respects. As a valuable landscape segment, the Morava meanders of Litovelské Pomoraví PLA at Nové Zámky deserve the highest protection. There is absolutely no need to disturb the area and change the character of the river and its alluvium. The D-O-E water corridor runs 4–6 kms away from the PLA. It results from comparison of the following course of the route, which runs mostly through the Pardubice Region. We shall thus postpone the actual comparison of pro and con to the relevant chapter. Let us recognize the lock alternative as more convenient for the route Střelice– Králová–Dubicko–Zábřeh na Moravě, and focus mainly on that option. To surpass the altitude differences of the described section of the lock route another high lock – along with the one in Střelice – was proposed at Králová. Similarly to the lift route, the lock alternative has to cross to the right Morava bank, i.e. to cross its valley alluvium as well as its bed. However, the situation is quite different from the previous routing: firstly, the crossing does not happen in the PLA area, secondly, the river would be crossed by a canal bridge, and its natural character would not be disturbed at all. The most important part of the lock route comes at the crossing of the valley alluvium. Without any extra costs needed, the body of the D-O-E water corridor would create a transversal dyke of a polder, plus its longitudinal lining on the west side, which would prevent inundation to reach the main railway corridor. A perfect functioning of the polder could be guaranteed by a functional facility, which might be a part of the canal bridge. The protection volume of the polder (which may be called polder Dubicko) could reach about 50–70 mill. m3. The effect on reduction of flood culminations would be as crucial as in the case of the polder in Teplice nad Bečvou. Moreover, it would significantly contribute to protection of Olomouc. The opportunity to establish the Dubicko polder is an indisputable advantage of the lock route. If even after transformation of the flood wave in the polder the flood control of the regional capital or other municipalities along the Morava was not sufficient, the flood could be also led through the canal – from Dubicko all the way to Kojetín. The above described sections of the waterway could have one rather important port in Olomouc, located in the developing industrial zone of the city, and in Hranice, right next to the Hranice cement mill (according to the official solution). Berths could be established at Pňovice, i.e. in the focus point of Litovel, Šternberk and Uničov, and at Zábřh na Moravě. Alternatively, a port could be established in Valašské Meziříčí near the existing chemical concern. To conclude this chapter, it is safe to say that construction of the D-O-E water corridor in the Olomouc Region could commence immediately. There is no doubt that flood control in the region is a priority task, which must not be postponed. • Realization of the polder in Teplice nad Bečvou according to the optimal concept, i.e. with the concurrent construction of a part of the D-O-E water corridor (within the first stage of its realization). • Realization of the Dubicko polder, with a dyke running along the route of the D-O-E water corridor and adjusted the way, which would allow a construction of a complete cross-section of the waterway in the future (also within the first realization stage). • Construction of the part of the Haná pool, which circles around Olomouc and Litovel, i.e. at least the section from Pňovice to Holice, as a flood diversion canal of the Morava River sections crossing the centres of these towns. Part of the flood discharge would enter the canal from a short feeder in the route Litovel–Pňovice and return to the Morava via an exit branch below Olomouc. The flood diversion canal of the future water corridor could be a dry, grassed bed with presently only a smaller profile. Construction of the D-O-E water corridor in the Olomouc Region indeed could begin immediately with no worries about any preliminary investments. Clear specification of needs and options as well as purposeful coordination of all operations are all that it requires in order not to waste funds on one-purpose projects, which are eventually more expensive than one complex solution. In the region of Moravian Silesia, namely of Ostrava, the project of the D-O-E water corridor has been always followed extremely closely perhaps for two reasons. First of all, the Ostrava region has been far the largest centre of coal mining and steel industry in the former Czechoslovakia. The “building enthusiasm” of the years of socialism even marked it as a “steel heart of the republic”. Extensive transportation demands connected with the mining and metallurgic industries inspired decades of strong efforts to link the region with a waterway network. The main argument of such efforts built on the fact that the Ostrava region is the last area of heavy industry in Europe which lacks connection to the inland navigation. The nearby ending point of the navigable Oder in Kożle was another obvious reason for the attention. The favourable viewing of the D-O-E project had also a certain real outcome, like the Koblov dam, finished in 1937, or the groundbreaking of the Oder–Danube Canal, which took place about 50 kms from Ostrava two years later. • The port of Ostrava on the D-O-E water corridor route should transship far the largest volume than any other port in the country. • Connection of the region to the waterway network will become the most significant development instrument in seeking new economic activities at the expected decline of the traditional ones. The D-O-E water corridor should be viewed as the region’s ticket from the tradition to the future. • The water corridor will provide a reliable flood control for all important locations of the region, namely for the major part of Ostrava and Bohumín. • In addition, the recreation and tourist navigation of the corridor route will increase the interest in the culture sights of the region. Today, such attitudes could be traced in thorough respecting of the D-O-E water corridor route in the region when other projects are realized, and it is also rather unambiguously defined. Apart from that, it is indisputable that the third stage of the water corridor should be realized not only on the Olomouc Region territory, but drawn as a compact unit all the way to the Ostrava central port. Let us take up where we have finished with description of the proposed route – in Jeseník nad Odrou, at a terrain point, which offers a convenient descent through a high lock from the summit pool to the level of the Oder valley alluvium. After the PLA Poodří was after-declared, the descent to the alluvium at Jeseník appears rather conflicting, as the route would disturb a short stretch of the meandering stream of this still very small river. Therefore, it was necessary to move the lock of descending branch to the village of Kunín. From this point on the route runs roughly along the edge of the Oder valley past Bartošovice and Albrechtičky to Petřvald, where the second and last high lock is to be established. Beyond the lock, the canal route heads on along the brim of the Oder alluvium to the south fringe of Ostrava, to enter the Oder riverbed. As it has already been reconstructed in terms of direction and even height due to the mining damage, only a certain deepening and partial widening could turn it into a part of the water corridor. Even after having moved the first descending lock from its original location at Jeseník nad Odrou to Kunín, the route will not avoid the PLA Poodří entirely and cut through some of its border parts. It is thus a question if it should not be entirely modified and led outside this area. Theoretically, it is plausible if it circles the airport of Mošnov from the eastern side. It has to be mentioned, that only in 1930s the proposed route was cutting straight through the airport area (at that time, no plans to create an airport were known) – which routing was naturally optimal. In 1950s it had to yield to military interests, which were hard to by-pass. Return to the original route is now practically impossible. The route circling around the airport from the east would have only a theoretical impact. Such change would not only imply higher investment costs but also take away from the protected area, which attractiveness is based on the artificial water formations. The complex of the Jistebnice lakes laces the western side of the Oder alluvium. A sensitively designed water corridor could very well run along the eastern part of it. Despite the large level differences which are to be surpassed by the locks at Kunín and Petřvald, there will be no high banks or deep cuts on the route, as both the locks are situated at convenient terrain points. A rather higher dykes and a “elevated” canal bed would be created only between Výškovice and Proskovice, in case the fall of the Výškovice lock (as suggested in some alternative designs) would be elevated by 5 ms and thus the Výškovice pool and the lock of Proskovice would be omitted. On the other hand, the water level elevation could be employed in a town aquapark with an artificial slalom track of the highest parameters, and in other facilities. The motorway D 47 (D1) bridge across the Oder at Mariánské hory takes into account future navigation of the dam pool in Lhotka (behind). This photo also enables to compare the construction demands of the traffic routes and explained why the construction costs of 1 km of the corridor do not exceed (and often even rate lower) the costs of 1 km of a motorway. Today, such attitudes could be traced in thorough respecting of the D-O-E water corridor route in the region when other projects are realized, and it is also rather unambiguously defined. Apart from that, it is indisputable that the third stage of the water corridor should be realized not only on the Olomouc Region territory, but drawn as a compact unit all the way to the Ostrava central port. Let us take up where we have finished with description of the proposed route – in Jeseník nad Odrou, at a terrain point, which offers a convenient descent through a high lock from the summit pool to the level of the Oder valley alluvium. After the PLA Poodří was after-declared, the descent to the alluvium at Jeseník appears rather conflicting, as the route would disturb a short stretch of the meandering stream of this still very small river. Therefore, it was necessary to move the lock of descending branch to the village of Kunín. From this point on the route runs roughly along the edge of the Oder valley past Bartošovice and Albrechtičky to Petřvald, where the second and last high lock is to be established. Beyond the lock, the canal route heads on along the brim of the Oder alluvium to the south fringe of Ostrava, to enter the Oder riverbed. As it has already been reconstructed in terms of direction and even height due to the mining damage, only a certain deepening and partial widening could turn it into a part of the water corridor. Even after having moved the first descending lock from its original location at Jeseník nad Odrou to Kunín, the route will not avoid the PLA Poodří entirely and cut through some of its border parts. It is thus a question if it should not be entirely modified and led outside this area. Theoretically, it is plausible if it circles the airport of Mošnov from the eastern side. It has to be mentioned, that only in 1930s the proposed route was cutting straight through the airport area (at that time, no plans to create an airport were known) – which routing was naturally optimal. In 1950s it had to yield to military interests, which were hard to by-pass. Return to the original route is now practically impossible. The route circling around the airport from the east would have only a theoretical impact. Such change would not only imply higher investment costs but also take away from the protected area, which attractiveness is based on the artificial water formations. The complex of the Jistebnice lakes laces the western side of the Oder alluvium. A sensitively designed water corridor could very well run along the eastern part of it. Despite the large level differences which are to be surpassed by the locks at Kunín and Petřvald, there will be no high banks or deep cuts on the route, as both the locks are situated at convenient terrain points. A rather higher dykes and a “elevated” canal bed would be created only between Výškovice and Proskovice, in case the fall of the Výškovice lock (as suggested in some alternative designs) would be elevated by 5 ms and thus the Výškovice pool and the lock of Proskovice would be omitted. On the other hand, the water level elevation could be employed in a town aquapark with an artificial slalom track of the highest parameters, and in other facilities. Utilization of the regulated Oder in the Ostrava area for navigation should be achieved mainly through deepening of the riverbed, not by elevation above the current water level. It will considerably increase the discharge capacity as well as the flood control of the adjacent parts of the city. The fixed dam in Svinov would remain basically unchanged. Also the movable one in Lhotka would remain fully in operation, nor would change the water level of its pool. On the other hand, the dam at Kopytov, north of Bohumín, will need to be newly established – its construction has been planned for over 50 years. Originally it was proposed to cut through (and thus basically ruin) the frontier meanders of the Oder above the mouth of the Olše. It was supposed to regulate draining of the subsidence areas, which had appeared due to extensive coal mining of the part of the pan. After all, the mine subsidences, sometimes even tens of metres deep, were the main reason on all regulations of the Oder and other rivers in the Ostrava-Karviná region. Had the regulations been carried out in 1960s, there would have been lakes in the area, drainable only by pumping. Prognoses of further mining and the related terrain subsidence were truly alarming only 20 years ago. They suggested that if the barrier of frontier meanders had not been removed, a large part of the city would have literally drowned. After the mining had eased up to cease eventually completely in the Ostrava part of the pan, the pessimistic forecasts lost their ground. The frontier meanders are, on the other hand, an increasingly valued natural phenomenon with no parallel on the whole stretch of the Oder from Ostrava to the sea. Therefore, the most currently favoured compromise solution leaves the meanders untouched and compensates for the low discharge capacity with a detour branch. The Kopytov dam and lock should be moved to its route, which would make the Oder navigable all the way to the state border – and complete the third stage. At the same time, it would provide a sufficient flood protection to Bohumín and the north part of Ostrava. Draft of sport marina at Bohumín (right bank variant of by-pass of border meanders of the river Odra). Similar marinas are planned along the entire route of DOE water corridor. Meeting of the Oder with the Olše (front) and the Polish Oder in the area of the polder Buków. Both the bridges already comply with the needs of navigation. On one hand, the abolition of mining in the Ostrava part of the pan contributes to the technical solution of the D-O-E water corridor, which can use the current adjustments and does not have to ponder on the complicated prognoses of the future terrain changes. On the other hand, such course of development prevents numerous mining and coal processing plants to be serviced directly via water transport. Also the significant metallurgical plants gradually lose the potential contact with the waterway. The Vítkovice metalwork is the closest to the Oder. 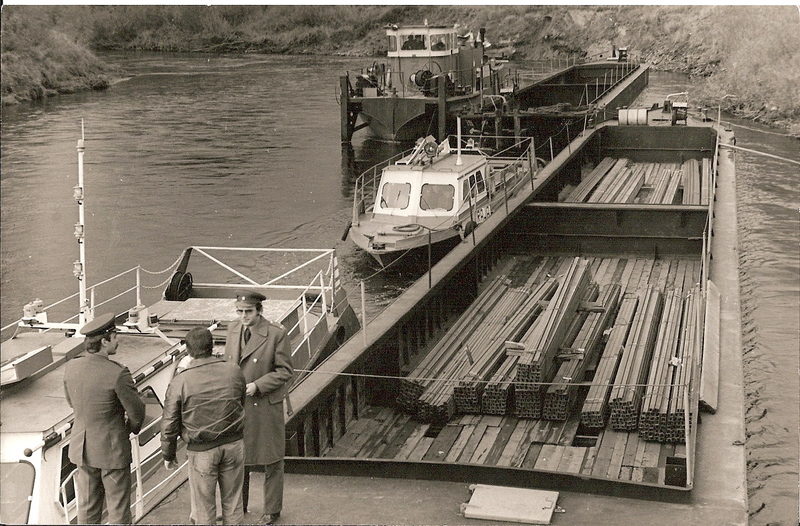 Even earlier, the plant had an opportunity to transport the ore directly to the ore-yard by water transport via a short branch along the river Ostravice. However, the traditional metallurgical operation in Vítkovice has been abolished and the manufacturing has moved to Nová Huť, which is much farther from the waterway. It seems that decades of postponing of the D-O-E project realization have left the Ostrava Region rather skeptical, and the planned waterway has disappeared form the priority agenda of the local politics. Concurrently, “the steel heart of the republic” has devalued in terms of the wider Czech or European economy. Ostrava will have to seek new supporting economic programs. It is not that rare. The very same situation has occurred in the Ruhr area, or in the mining and metallurgic centers of North France and in South Belgium. However, if you look for analogies, the waterway connection of these areas represented one of the magnets, which attracted new economic activities once the heavy industry had retreated. The D-O-E water corridor could very well help the Ostrava region in the same way. The D-O-E capacity water corridor will advantage the location of the region on the north-south transit axis and encourage development of transport and logistic services. For machine works manufacturing complete industrial plants or oversized and extremely heavy products, the waterway could mean indisputable advantage if not a new development impulse. Exploitation of the potential economic impact of the D-O-E water corridor naturally implies a sufficient ground reserves for development of ports, berths and other consecutive activities along the route. A detailed view of Vrbice (left) and Antošovice (right) lakes. The regulated Oder creates a green corridor in between. So far, there is proposed the central Ostrava port near Vrbice between Ostrava and Bohumín, where it could make use of the areas flooded after sand gravel quarrying. In Ostrava-Mariánské hory, there is another suitable area with a convenient direct contact with a large chemical plant. Not to forget, there is the planned international economic zone Lutyně–Věřnovice–Gorzyczki at the meeting of the Olše with the Oder. On the other hand, between Ostrava and Jeseník nad Odrou, the D-O-E water corridor should retain as natural character as possible, with no berths on the banks, with an exception of the airport of Mošnov, where an industrial zone connected with the large airport is designed. The section between the ending point of the navigable Oder at Kożle and the border of the Czech Republic spans to mere 50 km and features a highly convenient conditions for the construction of the D-O-E water corridor – even more favorable than the first stage between the Danube and South Moravia. Moreover, its construction already began in 1939. According to the contemporary concept, the connection should not have joined the Oder directly but only through then recently finished Gliwice Canal. Until the outbreak of WWII, the 6-km stretch of the canal from the pool Nowa Wieś to Kędzierzyn was almost completed. It was finished after the war and today it represents a navigation detour called Kędzierzyn Canal. It runs to the factory port of a large chemical plant (nitrogen factory) and it serves the water transport in the same way as the even shorter section near Vienna connecting the Danube and the port of Lobau. It actually means that 2 % of the entire water corridor between the Danube and the Oder are already used for water transport; unfortunately, it is hardly a statement to boast about. Routing and longitudinal section of the D-O-E water corridor, stage 1a. Place of the ceremonial groundbreaking of Oder-Danube canal (8 December 1939) today. From Gliwicki Canal continue a 6 km long completed stretch of the Oder-Danube Canal. The technical simplicity of the section between the state border to the navigable Oder was also a reason why it used to be considered a natural first stage of the canal construction. However, the current situation on the Oder waterway proves this postulate largely questionable. It would be a mistake, though, to exclude the possibility, that this stage would become a stage 1a. And not only for the low engineering demands of its route. Most of the alternations would have to be done for other, mainly flood control, reasons. Their realization is time pressing and often is already under its way. The area between the state border and the town of Racibórz is a key to flood control of towns on the Polish Oder. The Oder river basin has a form of a fan on the Czech territory. In a short stretch in the Ostrava region, four rivers meet – the Oder, the Opava, the Ostravice and the Olše. From a small river, the Oder turns into a rather large and especially willful stream. Concurrent flood waves from all four rivers could significantly endanger the Polish territory, as was last experienced in July 1997 or in May 2010. A flood diversion canal of the Oder circling around Racibórz. Its routing took into account needs of navigation, which basically all the bridges respect. For decades, a large reservoir had been considered above Racibórz, which would effectively decrease culmination of high water, and at the same time worked as a water reserve for navigation on the regulated Oder. For decades, there had been negotiations between the Czech and Polish sides about the concept of the reservoir and the maximum allowable water level. In the end, they decided for stage realization. Its first stage – which has been already finished – is the polder above the village of Buków, which represents the higher (smaller) part of the reservoir. The larger (lower) part, to be finished in the near future, will probably at the beginning also remain only a “dry“ polder and only later it will be adjusted in order to hold a certain water supply. At a glance, it may seem that realization of the Racibórz–Buków polder could not contribute to the waterway construction much. Quite to the contrary, though. The word “dry“ was quoted on purpose. On the flatland above the town of Racibórz, only a very shallow reservoir could be established, with only a limited volume. In order to increase it, the future polder bottom area has been subjected to extensive gravel sand quarrying, which reaches considerable depths. The bottom of the polder will thus keep water with sufficient navigation depth even at the minimal water level. A purposeful directing of the quarrying could provide a sufficient navigation channel from the state border to Racibórz. The waterway could just “happen” here basically for free. In the section from the future dyke dam above Racibórz, there is a flood diversion canal, which was built between the wars with the respect to its future integration to the waterway to protect the town. It represents another nearly ready-made stretch of the D-O-E water corridor. From the point where the canal meets the Oder again it is mere 25 kms to reach the navigable part of the Oder. There are basically two alternative solutions. The first could connect with the Kędzierzyn Canal and run along the contour line without any locks. It is actually the route, which was proposed to be built in 1939. The other option (currently favoured by the Polish side) should head as a navigation diversion canal to the pool of the existing dam Koźle, which is again a nearly ready stretch of the waterway. This alternative would call for a lock of a medium fall. At the dam Koźle, again, a new large lock would have to be established, as the existing one, of too small dimensions, is rather a historical sight currently. The hesitant attitude on the Polish side at the negotiations about the prior realization of the stage 1a, i.e. connection of Ostrava to the navigable Oder, only confirmed that. Despite the relative cost modesty of the stage (especially if all the necessary facilities were incorporated in the concept of the Racibórz reservoir), the negotiations did not come to any satisfactory conclusion. After decades of wasted post-war years, it looks that the better times are about to dawn. In 1998, at the presidential visit of Václav Havel to Warsaw, the cooperation on connection of CR to the navigable Oder was agreed. The Polish president Aleksander Kwasniewski actually expressed his hope to see the Czech vessels with goods navigate to the Polish ports. Subsequently, in 1999, the Czech Ministry of Transport signed a memorandum with the Polish Ministry of Environment, which established a Czech-Polish expert committee preparing documentation of making the Oder navigable between Koźle and Ostrava, with a special respect to realization of the Racibórz reservoir. The mutual Oder committee (OKO) worked relatively intensively until 2003 and drew a quality study for both the Czech and the Polish part of the project. After certain personnel changes at the Czech Ministry of Transport, the further activities ceased and the committee have not met for several years until 2010 when was the committee resumed. At its lowest part, the watershed ridge between the Danube and the Elbe is about 120 ms higher than the area of the Moravian Gate. Also the morphology of the terrain, which divides the watershed to the Haná side and the Elbe flatland on the other side, is far from favourable for the D-O-E water corridor routing. Searching for optimal solution has never been an easy task. It gave birth to a large number of alternative solutions; neither of them has been so far chosen as the final one, although it is safe to say that from the large choice there are basically two, vastly different alternatives remaining. As another consequence of the section demandingness, it has always been considered as the fourth stage to be built, the last one, realized rather in farther future. When describing the technical possibilities for surpassing the altitude differences on the waterway, it was said that the concerned section of the Elbe branch is pretty much the only one suitable for effective application of boatlifts, i.e. boatlifts of extreme falls. The two options considered have already been marked as the lift and lock alternatives. The official solution has so far favoured the lift one, although modified. Nevertheless, we present it as an alternative and in the graphic insert we prefer a more exact documentation of the modernized lock route for its indisputable, while still underestimated advantages. The routing solution of the D-O-E water corridor in the Pardubice Region is serious challenge for bold designer engineers mainly for two reasons. Firstly, the gaps at Česká Třebová are still higher than the Moravian Gate; to lead the water corridor across will call for some more complicated facilities. Secondly, the area offers an opportunity to combine the water and the high-speed railway corridors. If such combination succeeds, it could be a “project of the century” with the top shelf technological, economic and environment-improving parameters. That would remarkably increase the tourist attractiveness of the region. The lift route heads for the watershed through the Třebůvka River valley, which it enters at Loštice. Let us remind you of the above-mentioned conclusion, that the access to the valley leads only through the PLA Litovelské Pomoraví, which handicaps, if not disqualifies, the alternative rather heavily. Neither the entrance to the valley is easy – according to the last solution, it would require a shorter navigation tunnel. On the other hand, pass through the valley around Bouzov and Vranová Lhota would be technically rather simple all the way to Pěčíkov. Pěčíkov offers an exceptional advantage as an approximately 100-m lift could be established there, allowing ascend to the 390 ms ASL, to the altitude of the summit pool, through a single boatlift. Why should such extreme concentration of fall be seen as an advantage? First of all, the only boatlift would substitute for four high locks, which is very interesting in the least. However, that was not the chief reason of searching for a convenient place for such a high lift. 1960s saw the main and prevailing purpose of a waterway in transferring water and in the energetic effect of repumping. A long summit pool, bordered with the highest possible lifts or inclines on both the ascending and descending branches then seemed an optimal solution from the energetic point of view. It was actually a highly efficient pumped storage hydropower station. They had even managed to find the “mirror image” of Pěčíkov at Zálší near Choceň, where another 100-m incline could be established, allowing descend directly to the level of the Elbe flatland. The only remaining problem was to find a convenient route of the summit pool, which would connect, optimally on the contour level both the locations – Pěčíkov and Zálší. The route was then to run from Pěčíkov via Staré Město north from Moravská Třebová to the watershed at Třebovice and then past Česká Třebová to the Řetůvka River valley to Zálší. Running the D-O-E water corridor route in this line is far from easy. In the very beginning, it was clear that it would call for navigation tunnels (especially at Třebovice, where a deep cut is out of question for the inconvenient geological reasons) or canal bridges across the deeper valleys, which the route cannot avoid. All the same, in 1960s the lift route seemed to be the correct and sharp solution for the easiest possible pass across the watershed. Moreover, when compared to the earlier routing through the Moravská Sázava and Tichá Orlice valleys, it featured remarkable advantages. The navigable Elbe River near Kunětická hora. Along with a considerable lower number of locks or lifts, it prevented any collision with the main railway (corridor) lines running through the valleys. In the following years, as the lift route was being more specified, its advantages seemed to give way to ever longer stretches of problematic sections. The change of limits, which outlined the large transport of water management project in their relation to environment, also played its role. Step by step it led to efforts to reduce the environmental conflicts, or rather to their entire elimination. That was only possible with gradual increase of extremely costly solutions, especially prolonging of the navigation tunnels. Today, it seems hardly advantageous to tackle the pass across the watershed with two extremely high lifts. The idea of two high falls on each end with an efficient pumped storage hydropower station connected to the summit pool has lost its topicality to remain a criterion of convenience for the solution. One of our most significant hydro-engineers, Ing. Libor Záruba-Pfefferman, who holds credits for domestic world-class water projects, used to say that waste bin is the most valued device of every designer. He was right. Even after hundreds hours of work, when the designers reach the best possible solution, they should still be able to discard it as soon as a suspicion arises that there may be a different, more convenient way how to achieve the assigned goal. Even if it involves new and cleverer interpretations of principles, which has seemed to be outdone. In case of the D-O-E water corridor section in the Danube- Elbe watershed area, it means a return to the “old ” lock alternative, or rather its new reinterpretation. The chapter on the Olomouc Region has already established its major advantages: it entirely avoids the PLA Litovelské Pomoraví and allows easy realization of the Dubicko polder. On the other hand, the lock route has to break through the narrow valleys of the Moravská Sázava and Tichá Orlice and intrude itself into the slim space, which has been left behind the railway corridor. It runs along here the left there the right side of the valleys and at times creates a truly impassable barrier. However, concurrence of the D-O-E water and railway corridors could be treated even differently, if you get back to the above-mentioned cooperation of different types of transport in multimodal corridors, which could very conveniently appear in line with the D-O-E waterway. Gradual conversion of the traditional transit corridors into high-speed railway lines could create one element of such project. The process is relatively easy to carry out almost everywhere, with the exception of the above-mentioned valleys, as no sub-corrections would lead to the basic parameters, i.e. the line speed of conventional fast trains about 200 kms/h, and about 300 kms/h with highspeed units. Such speed requires a track route with minimal radii of bends 5,000 or even 7,000 ms. To squeeze such radii into the valleys of the Moravská Sázava and the Tichá Orlice is absolutely implausible. To achieve the high-speed parameters from Zábřeh na Moravě all the way to Choceň would only be possible if the corridor avoided the valleys entirely and a new railway route was constructed. The radical route transfers will naturally meet objections to their extremely high costingness. However, it is imperative to compare total costs spent on the prospective transport infrastructure as such. One of the scenarios which does not respect mutual coordination of both projects will be characterized by a sum of costs spent on hundreds of kilometres of entirely new high-speed railway tracks and on the more demanding routing of the D-O-E water corridor across the Danube–Elbe watershed, which call for a number of partial route transfers and compromises. The other alternative will require investment costs on the gradual conversion of the existing transit corridors, including the costly tunnel transfers in the above-stated short section, which is going to be considerably balanced by savings at realization of the D-O-E water corridor in the “freed” valleys. One glance only proves the second scenario to be worth minimally some decent attention. If you have agreed on such argument, it is rather simple to imagine the easy routing of the D-O-E water corridor through the water valleys of the Moravská Sázava and Tichá Orlice. It would be characterized by a meandering route requiring minimal excavation work. In places it would spread into shallow “lakes” employable in recreation, which would thrive in the peaceful environment with no loud railway. Routing through the Moravská Sázava valley would offer another special advantage: The water corridor could be easily connected with the large reservoir at Hoštejn on the Březná River, which due to the morphology, would only call for a not very expensive dam. Its flooded area would interfere with the traffic network or housing development only minorly. We dare to mention that only rather sheepishly as we can already hear the protesting voices that the waterway is of no need for such reservoir, and thus is the only cause for the flooded valley of the Březná. However, it is far from true. Considering, even just hypothetically, that in some 100 years, the pessimistic forecasts of greenhouse effect come true, as well as those of disaster collapse of Central European water balance, it will be necessary to lean the balance far more on the Danube, to transfer much larger volumes of water – but only in shorter periods which would correspond with the high discharges of this large stream. Most probably, it would be necessary to accumulate part of the water. Suitable reservoirs would have to be found (with the largest possible volume and smallest possible flooded area); they could be established even in places with no natural outlet, limited only by easy transfer of the pumped water. The reservoir on the Březná meets all such standards, as it is directly on the waterway route. There is another reservoir possibility on the Oder near Spálov, although it is quite distant from the route. However, it could concern more than just Danube water. The chapter on water management balance has already mentioned the re-distributional function of the water corridor, which should guarantee that virtually every drop is captured not to leave the country without being utilized – or even causing flood damage on its way. To achieve such goal, the river basin of the Morava above the Bečva mouth would have to be fitted with a reservoir of hundreds of millions cubic meters. Such facility is impossible to be established in the Haná flatland, but only on the very upper stretches of the Morava and its feeders, in the mountain valleys. The hydrological conditions of the area are so inconvenient, though, that the condition of maximum capture of surplus discharges would not be met even with ten such reservoirs. Modernization of the second railway corridor eliminated the inconvenient bends with a tunnel, which cuts the meander or rather the hill Hejnice. A short tunnel through this hill could accommodate even the route of the D-O-E water corridor, in this section running alongside the railway track (photo 2007). On the other hand, the only reservoir at Hoštejn could – owing to the direct link to the D-O-E water corridor – satisfactorily manage the entire drainage of the Morava below the mouth of the Moravská Sázava, plus of the Tichá and Divoká Orlice on the Czech side of the watershed. It could easily become a crucial reservoir for the problematic water management of the river basins of the Morava above the Dyje and the Elbe above the meeting with the Vltava. It is again necessary to mention that the waterway truly does not need such reservoirs, the water management, on the other hand, will be in an urgent need of them in the time of our great grandchildren’s adulthood. We do not say more than that there are such options, which should be viewed as a benefit of the D-O-E water corridor, not as its negative feature. By no means it is trying to say that the D-O-E water corridor routing solution could not do without larger reservoirs or costly transfers of concurrent railway tracks. The last studies of the lock route suggested some further simplification of its solution. It is quite clear that locks are operationally speaking more convenient than boatlifts, as they allow one-time locking of even longer convoys. However, it is not to be omitted that this feature could turn less advantageous when there are too many successive locks on a relatively long route given by the pass over the watershed. Although the watershed in Dobrouč gap is quite morphologically and geologically convenient, it requires a rather significant deflection to the north. The entire section between Střelice and Dvořisko u Chocně would thus call for 13 locks, while the lift alternative only for 4 locks and 2 high rise lifts. Other example of an appropriate high-speed railway routing is near the Česká Třebová junction. It would call for two long tunnels, one of which could probably accommodate even the D-O-E water corridor. The engineers tried to shorten the lock route as well as reduce the number of its locks. It was rather tempting to lower the summit pool, resign on the lowest spot of the continental watershed and build a navigation tunnel. However unconventional proposal is, it does not steer that far away from common practice to be found too odd. We have already mentioned the longest navigation tunnel of the world, which was built in France at the beginning of 20th century. It is 7.12 kms long and its profile is larger than the one required for the D-O-E water corridor purposes. It was built by conventional tunnelling methods, which have been long outdone by the modern methods especially due to constructions of motorway tunnels. The efforts to find a tunnel route with the summit pool at the considerably lower altitude was thus by no means inept – the lift route had to count with tunnels anyway. Eventually, between Rudoltice and Dlouhá Třebová, there was designated an area, where the watershed could be surpassed in a tunnel of 7.6 kms, while the current altitude of the summit pool was lowered by 40 ms, the route length was reduced, and the number of locks got smaller by 4. However, the gained savings, especially on the four locks, would be exceeded by the extra costs on the long tunnel. The approximate comparison of the main features of individual alternatives of the section Střelice–Dvořisko u Chocně are best shown in a simple table. Construction of 7.6-km tunnel between Rudoltice and Dlouhá Třebová brings about the question of transport capacity of the waterway. The tunnel would naturally be one vessel only in order to keep its costs bearable. It seems that the problem has a solution; moreover the tunnel has one rather important feature: very conveniently, it could accommodate even the high-speed track, which would thus avoid not only the junction of Česká Třebová but also the unfavourable bends to the east and west of the tunnel. Thus, it would deal with the last obstacles in the way of “new generation expresses” on this spinal line connection. Nevertheless, it should be admitted that the final choice of the optimal routing of the D-O-E water corridor in the area of the Danube–Elbe watershed is not an easy one. Wide and largely unconventional solutions are in the game and the final word has not been uttered yet. Let us lighten the topic with the following description, which leaves behind the demanding terrain and moves to the area of Dvořisko u Chocně. Navigation lock on the River Elbe in Pardubice was completed in 1969. At its basin has follow the route of D-O-E water corridor. All the proposed alternative routes again meet up there and the next part of the route leads through a rather simple terrain to the south from the main railway line all the way to the eastern outskirts of Pardubice, where it crosses the track and finally joins the Elbe. That is also, where our tour comes to the end. At conclusion of the chapter, there is one note only to be added. Although it could seem that the attention to the fourth stage of the D-O-E water corridor realization in the complex of concurrent types of transport would be directly proportional to the complexity of the problematic, it is rather the other way round. There have occurred partial adjustments of railway corridor routes while the designers are not aware of the fact that there is a certain interest in realization of a waterway in the area. The attention of respective authorities to the solution of the project in this demanding section equals zero. Thus, conflicts are rather being produced than efficiently resolved.